“A Ghost in the Forest” is auction ready! Thank you to Mary for the excellent matting and framing. Usually, I don’t donate original art. However, this cause is near and dear to my heart. So this is the original going on the block. If I did my job right, the bidders will come ready to bid! This is one item among many being auctioned to raise money for forestry education. The auction is Friday, February 6. This auction is a fund-raiser for the Education Fund of the Sierra Cascade Logging Conference. The money goes for forestry education for local students. It supports Education Day for hundreds of local 4th graders to tour the conference. Mary, of Sneaking Bliss, gives a presentation to them each year. This was her post from last year’s tour, Sierra Cascade Logging Conference Education Day. The money also supports the local college logging sports team, scholarships and a Spring woods tour for students, among other things. Mary delivers her presentation to my nephew’s 4th grade class, from a couple years ago. My nephew was volunteered to help out. I’ve include a progression of the painting in the gallery shown below. Click on the images to enlarge. “A Ghost In The Forest”, is auction ready! Thank you to Mary for the excellent matting and framing. The ink outline on the steam donkey was done with a Lamy All Star extra-fine point. I did the black shading with the Yuretake No. 50 brush pen. Then started detailing with a Staedtler 0.05 pigment liner. It has a finer line than the Lamy extra-fine tip. The donkey detail is mostly complete. I soak the paper in the bath tub. The water was room temperature. Be sure to test your inks for running before you use this on an important piece. Two minutes on the timer for soaking 90 lb paper. It came out a little too saturated. I should have used cold water. For 140 lb paper I soak for seven minutes in cool water. You need a very clean surface, because the sheet goes ink down. On go the stretcher boards. Staple it to the boards. Snug it as you go, but not overly tight or the paper may rip when it dries. Use a paper towel to mop up excess water. Don’t push down or you’ll damage the paper. A feather light touch is required. I elevate the mounted paper for good air circulation. Even drying makes for a nice tight stretch. Let it dry naturally. Using a heater or blow drier can cause ripples in your paper. It should thump like a drum when dry. The color is going and the background is developing. I’m well into the awkward phase and the quality of the photo doesn’t show very well. One Step Closer. The forest is coming along. “A Ghost In The Forest, completed and framed. These images are included in my previous posts with more information about the real steam donkey and the art process. This entry was posted in Drawing, Forestry, Pen and Ink, Watercolors, Watercolour and tagged Forester Artist, forestry, logging, pen and ink, steam donkey, watercolor, watercolour, Willamette Steam Donkey by foresterartist. Bookmark the permalink. Tim, The Forester Artist, has completed another wonderful painting for our local auction in support of forestry education. Tim, you captured the feeling of the place and time with both the art and the title! Awesome, and for a great cause too! Thank you so much Zach! I’m glad you think so. It is quite realistic. Great job. Thank you Ilex! I’m with you. I want to see these kids getting outdoors. Hopefully, we’re cultivating a new crop of future foresters! Congratulations Tim your painting turned out beautifully, way to go with the donation for forestry education. Really enjoyed seeing the process, love seeing it framed. Thank you Mary! I already heard some interest in it and that’s a good sign. I’m REALLY happy to have it done! An interesting creative process. The result is wonderful! Satisfying to see how well you’ve mastered color, along with your usual ink perfection! Thank you so much Alli. I wouldn’t say I’ve mastered anything, but I really appreciate your comment. Thank you very much for the reblog Lisa! I know what you mean. I took a high quality scan of it as a pen and ink. Then another at the finish. That way I can offer it as a print in pen and ink or mixed media. Tim, wonderful piece. I am very curious about some of the steps in your process. What type of paper did you use, that you were able to soak and then stretch on stretcher bars. And why? What did that do to the inking process for you to continue with color? I use a hot press Canson 90 lb paper, because I wanted a pretty smooth surface for the pen and ink. I did soak and stretch it after I drew the pen and ink. I tested every pen I had with this same process before doing the actual art to avoid and disasters. I had no problems with the ink drawing as a result of the soaking and stretching. The paper took the watercolor normally. I usually stretch my paper for water color this way except when using 300 lb paper. It’s easier for me to do the pen and ink work on a drawing board rather than on the stretch boards. It’s just my preference. It was the first time I’ve tried it this way and it worked great. I use for certain drawings, (using pen & Ink/watercolor) Arches Hot pressed 140 lb for the smooth surface, like you seek. I guess because I use a dry (slightly wet brush) on dry in order to achieve a dabbed layer effect which doesn’t effect the quality of my pen & ink line work, I haven’t been aware of the soaking and stretching process. Thanks Tim, I’m going to look into this process. Also, good luck with the Auction. Thanks, it’s just a few hours away. I look forward to seeing the result. I really prefer the 140 lb paper. I used the 90 lb, because it was the only paper smooth enough that I already had. Wow! Beautiful. Hope the auction goes well. Thank you Catherine. I hope it goes well too. I’ll know tonight. This turned out wonderfully! I hope it sells for a lot for your worthy cause! Thank you Ruth. It sold for $900. Congratulations on art and project. 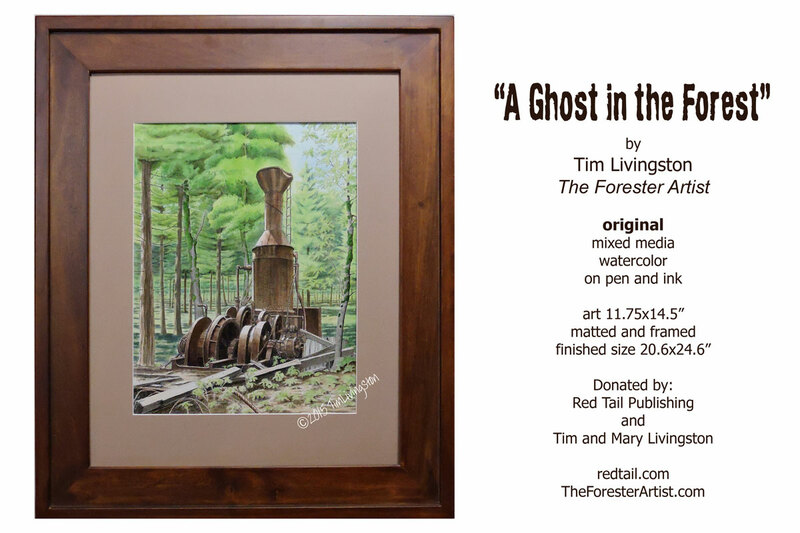 You are really an entusiastic artist and logger, keep up the good work, Tim! Thank you Bente. Although my logger friends would tell you I’m no logger. That’s because I’m a forester. I’ve never seen watercolor stretched like that. What amazing work. Love your beautiful and detailed ink work. Thank you so much Joy. If you like working on stretched paper, I think it’s a good technique. tracking the progress of your art is fascinating! Hopefully, it wasn’t too disjointed. Sometimes, I get so focused on the project that I forget to stop and take a picture or scan.